"Stratford was superlatively situated to become a furniture centre, set within reach of early, magnificent tracts of trees ... oaks and pine several feet through ... maples, birches, black walnut and basswoods. It had been built by a river suitable for sawmills, with good rail and road connections soon developing. Skilled Swiss and German craftsmen from Pennsylvania had already sifted north into Waterloo County, where Jacob Hoffman’s furniture factory, the first established in Berlin, in 1830, had been turning out work while the first settlers were making their way to Little Thames. 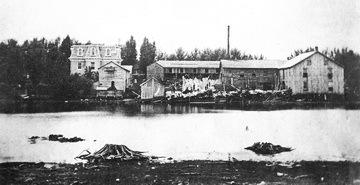 "In the furniture tract of Upper Canada – Waterloo, Perth, Oxford and surrounding counties – furniture plants usually originated in one of two predictable ways: a sawmill and planning mill would expand into the manufacture of window and door frames – as did the Scrimgeours -- or a cabinet maker would diversify and increase production. Alexander Scrimgeour and his two sons, David and Alexander Jr., also built many fines homes and buildings of early Stratford. 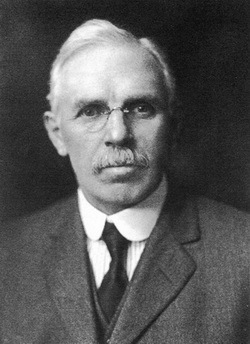 George Porteous joined the firm and developed the furniture wing. Messrs. McLagan amd Porteous, two enterprising and industrious young men, have leased the furniture manufacturing shops from the Scrimgeour Brothers. "Canadian-born and skilled in cabinetry work from his "learning years" in the furniture mecca of Grand Rapids, Michigan, the young McLagan arrived in town full of plans and enthusiasm. Canadian Furniture still was, for the most part, heavy, unoriginal, often with ugly proportions and overpowering lacings of "gingerbread" decoration. Into this scene came the young George McLagan, hating the ornate and the fussy, possessing a finely-tuned knowledge of how to make furniture strong and substantial, yet graceful in proportions, and both simple and dignified. "On the night of March 1, 1900, George and most of Stratford were packed into the old ice rink where the junior hockey team was playing Peterborough in the second game of a home-and-home O.H.A. playoff series. The Stratford team had a deficit of several goals to make up and tension was mounting. Midway through the game, word raced through the rink. The Easson Mill is burning! McLagan’s is on fire too. In minutes, the rink was emptied of a third of the spectators. George McLagan stood on the crowded Huron Street Bridge with his fellow citizens and watched his factory burn. "The factory is one of the best equipped of its kind in Canada; not so large as some, but its equipment and conveniences are the best that thoughtful, practical knowledge has found necessary. Profiting by former experience of the dire results of want of adequate fire protection, the management have equipped the factory with the latest and most approved system of fire-fighting appliances. Over 1200 sprinkler heads connected with the city water mains are circulated throughout the building." "In spite of the depression in business our sales this fall in phonographs and associated lines has been away ahead of those last fall," remarked a furniture retailer to Furniture Journal the other day. "It seems strange, but it is nevertheless true that there are many people who have money for what will entertain them, but not a cent for needed furniture which gives them actual comfort." ... "Nothing will attract the public like music. 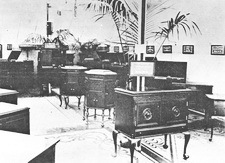 Therefore, a phonograph department is not only profitable in itself, but many people are attracted to the store." 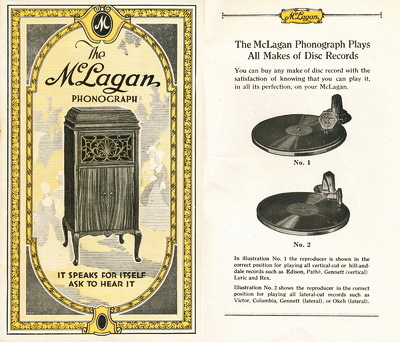 In 1916, the McLagan Phonograph Corporation Limited introduced over a dozen different floor model phonograph models with the slogan, "The McLagan Phonograph, It Speaks For Itself, Ask to Hear It". The McLagan factory was a furniture manufacturer, and therefore imported the motor, tone arm and reproducers from 3rd party suppliers. The distinct features of McLagan Phonographs are the McLagan-Fletcher tone arm and the reproducer from Chicago. In Edward B. Moogk’s book "Roll Back the Years" he also adds that McLagan was importing the lateral-cut Lyric records. "George H. McLagan was sitting in his office chair in the McLagan plant when he fell over dead without warning." The people of Stratford were shocked and saddened to lose such a prominent citizen. Mr. McLagan died at the peak of his career as "one of the country’s most successful furniture manufacturers". 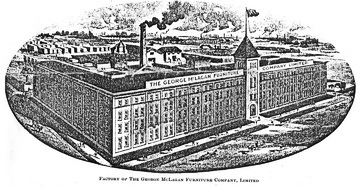 George McLagan was always actively involved in the manufacturing and the design of the furniture. 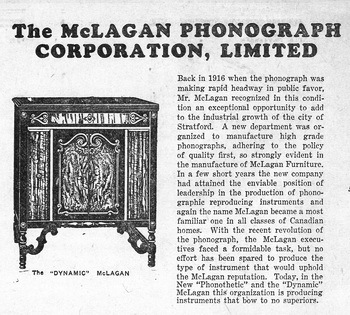 In the same year, 1918, the McLagan Company had a display of their phonographs at the Toronto National Exhibition. By 1928, Stratford made one sixth of all the furniture made in Canada. 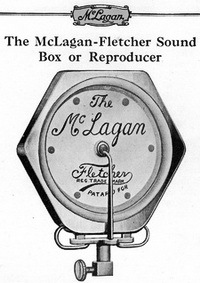 McLagan further developed the phonograph with the new "Phonothetic" and the "Dynamic" phonographs. 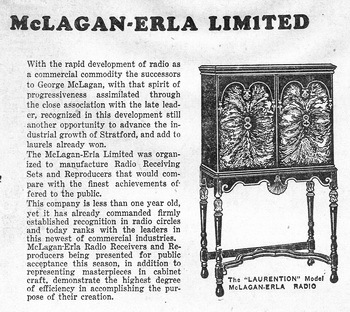 With the rapid development of the radio, the McLagan Corporation introduced the McLagan-Erla radio in 1927. 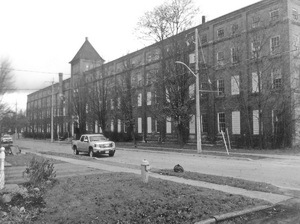 Note: Dutch immigrants in Canada, that wanted to enlist in the war effort, came here to the Stratford barracks. Krug Furniture presently occupies the building. For more information, please check out Keith Wright’s "The Canadian Antique Phonograph Project" at the CAPS website, specifically the McLagan Phonograph.